The 4th Texas, Company F, also known as “The Mustang Greys” is a family oriented, non-profit club based out of Las Vegas, Nevada. The 4th is dedicated to preserving the memory and spirit of those individuals who bravely participated in the American Civil War (1861-1865). The primary activities used by the 4th to educate the public are Living History programs at public events and Battlefield re-enactments. The 4th provides a safe and fun, family-appropriate environment for its members, and is founded on the principal that there is room in our hobby for a wide range of participation. As such we do not have an upper or lower age cap, but do require Minors to have appropriate supervision. We recruit across Southern Nevada, so please contact us if you are interested in joining our unit. 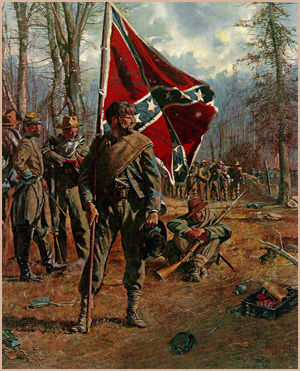 We portray Company F of the 4th Texas Infantry as it may have appeared in the early spring of 1864. So the 4th is still in its winter quarters. The unit has been outfitted and supplied with new uniforms, equipment and most importantly replacements. This company uses a mixture of Wall tents, larger sized wedge tents, and "Dog" tents for the soldiers of the company. Our Civilian Relief Society along with several of the officer, NCO, and junior enlisted families have joined the Brigade in camp so we have more wall tents than most units have. Our unit is a mixture of veterans who are eating well for the first time in many months (as you can probably tell!) and replacements just arrived from Texas. Most of our unit carries the M1855 Springfield Rifled Musket or the M1853 Enfield, and wear the regulation grey sack coat and light blue pants. Some of the replacements were issued the M1853 Enfield Rifled Musket, while some of our veterans have picked the M1861 or M1863 Springfield up on the battlefield as well. This all occurred none to soon considering the battles that were still to come. Please stop by our camp, or contact us online, and we will be happy to answer your questions.